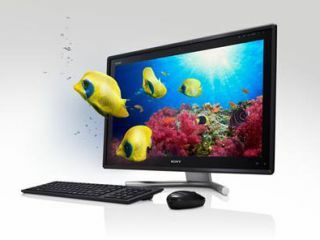 The latest 3D Sony Vaio L series touchscreen multimedia all-in-one PC will be shown off at IFA 2011. The Vaio L 3D - or Vaio VPCL21S1E/B to give its full name – is described as a slim all-in-one desktop with a 24-inch Full HD Vaio LED backlight display. It has 2D to 3D upscale from the touch of a button and has a 3D HDMI input which will allow you to connect up your PS3 and play 3D games. "New VAIO L Series 3D offers more ways to enjoy your favourite entertainment," explains Sony. "'Native' supported 3D content includes movies on Blu-ray Disc, games and videos. You can also enjoy 3D panoramic still images captured with Cyber-shot digital cameras and Alpha DSLR digital cameras by Sony," it continue. "There's also a dedicated button on the bezel that instantly converts 2D content like Blu-ray Disc movies to simulated 3D at a single touch." Also bundled is Family Paint 3D software, an integrated HD webcam, a WEB button to "get you online in seconds" and an HDMI out so you can route the picture into your HD television.